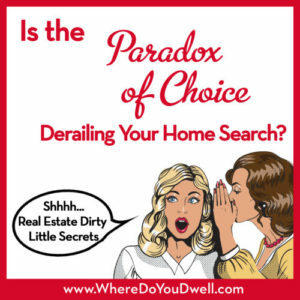 Is the “Paradox of Choice” Derailing Your Home Search? As a buyer do you find yourself “wanting to see everything” in your price range or “needing to look at just one more house or condo”? You may truly believe that having a wide selection of homes to choose from is the only way to find one you love. Guess what? It’s a proven fact that having too many choices only increases your chance of making the wrong choice! One of our favorite books here at Dwell Residential is “The Paradox of Choice” by Barry Schwartz. We often discuss the moral of this book with clients and on occasion give a copy to those who are having a hard time making a choice. Research has shown that having too many choices – from selecting jam to choosing a mutual fund package, or from finding a mate to picking a home – can overwhelm and stress people. They become so confused and reach a point where they feel paralyzed with indecision. These buyers also experience an increased feeling of regret or dissatisfaction once a decision is made. Many can’t get passed the thought that one of the other choices would have been better. Has that ever been you? Most likely you face an insane number of choices for all sorts of products, whether you’re at the grocery store, the shopping mall, or the car lot. We’re talking about both the big and small purchases in your life! An entire aisle of cereal is the norm now. At one time shopping for jeans meant Levi’s, and that was pretty much it. How long does it take you to find that perfect pair now? Or decide how much to spend? When it comes to house hunting, you do want to have a healthy inventory of listings to view, but thinking “seeing more is better” can actually sidetrack your home search. More choice can cause confusion, second guessing, and just being overwhelmed. For example, if you spend the day (and weeks) looking at so many homes, you can start feeling confused about the features of each one. Your mind will start going in circles trying to distinguish each home. Plus it’s just harder to narrow down your choices and start to eliminate homes when you have viewed way too many. There are several strategies to make your search successful and satisfying from beginning to end. This means you’ll need to learn how to narrow down your choices. Spend time “researching” before you’re a serious buyer. Get educated about your local market in terms of price, location and features. Visit open houses, go online, and talk to trusted and reliable friends about how they made their home-buying decision. This way your expectations are realistic and you’ll be more confident when you do become a serious buyer with an agent. Do your best to keep this time productive and perhaps even with a deadline but don’t feel rushed or stressed. That way you can move on to becoming a ready buyer, or you’ll still be “looking” two years down the road. Stick with your budget and price range. You’ll increase your doubt, confusion, and dissatisfaction if you start to see homes outside your price range—lower or higher. You’re just adding more choices (and not good ones for you!). You should have already done your research so this action is an unnecessary waste of energy and time. Compare apples to apples. It’s not a good idea to compare houses that are in two very different locations – it will only lead to “analysis paralysis”! For example, a home in the suburbs is most likely going to be bigger and possible newer than a similar priced home in the most desirable location in a more urban area. To avoid this from happening, you first need to narrow your location by deciding what lifestyle you want. However, if you decide to be open to other locations, compare similar homes within the specific location. Remember having “enough choices” doesn’t mean a large number. Too many choices can be daunting, so you want to aim for “enough” choices. This way you’ll be confident in your decision and satisfied that you’re not shortchanging yourself with too few choices. Work with your agent so that you view “enough” homes that meet your list’s criteria. Keep eliminating homes and move on. When you view a home, it’s either a “yes” or “no” and then on to the next one. Eliminate as you go along so you can keep your selection to two to three homes (just like HGTV’s “House Hunters”). Don’t “keep it in the running” just in case! You’ll end up with too many “maybe’s” to whittle down. Another strategy is to ask yourself what home you like better—the one you are in right now or the ones you just saw. Then pick your favorite of the day. Don’t worry you’re missing out. Your agent can explain to you why the homes she choose NOT to show you don’t match your list, are out of your price range, or have something that you consider a deal breaker. Your agent is there to help pare down the number of homes to view and keep you focused. Avoid becoming an MLS junkie. It’s hard in today’s market to not search the internet to see what’s been newly listed. Just remember to keep it in check and limit the time you spend trying to catch every new listing. You can tell your agent if you’ve seen something that’s a match but don’t become obsessed or anxious about every new listing and second-guess too much. Learn to embrace “good enough.” We do want you to find a home you love. However, no home is going to have everything on your list and still meet your budget. Accept that your decision on a home may come with some sacrifice of a want on your list. Making a choice does mean you’ll be passing up opportunities to look at future listings, but you’ll be stuck “looking forever” and never move into a home. Do you want that to happen? Let us know if you have any questions about choosing a home and if you’re think you’re afraid you’ll experience choice overload. We definitely recommend reading “The Paradox of Choice” for further insight. Next week is another hot topic for many first-time buyers. Are you afraid that your student loan is preventing you from becoming a homeowner? Then you’ll love How to Buy a Home with Student Loan Debt, which continues Our Dirty Little Secrets to Buying a Home series.